can anyone recommend a low weight 10.5" barrel in 5.56? Primary arms has a 1/7 10.5 barrel by radical firearms listed as 1lb 1.6 oz...however the radical firearms website lists this barrel as 1 lb 10.6 oz, so one is mistaken. 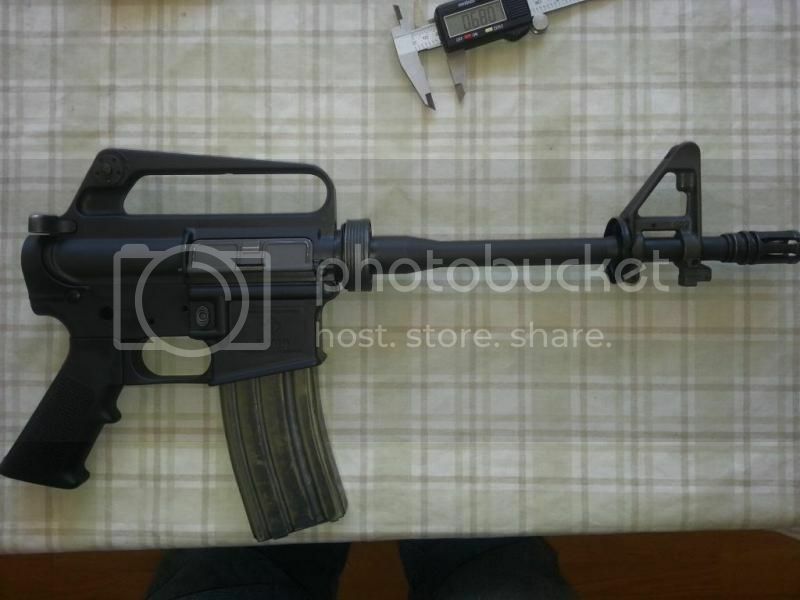 Can anyone shed light on this one or any other 10.5" barrels around a pound? Look for lightweight .625 gas block area barrels if you want a really lightweight barrel. Or have a pencil profile carbine barrel cut down to 10.5 and have the gas ports opened to .80". Most CMV barrels are lighter than SS due to SS profiles typically being heavier. 1 lb 10.6 oz sounds like a HEAVY profile. I have a Noveske SS with medium profile and it weighs 1 lb 8 oz. And it is a pretty beefy barrel. Most 11.5 govt profile CMV/CHF barrels I have been looking at are around 1 lb 2 oz.- 1lb 5 oz. J&T has a LW 10.5". With or without chrome bore. 1-9 tho. And also comes with a FSB. .625 at the gas port. Here it is. Another forum members pic I kept for reference. I just finished up a pistol build with a Noveske 10.5" CHF barrel. It weighs in at 1lb. 8oz. with the gas block. IMHO, one of the best barrels you can buy. It's also built based on the M249 Saw Spec. I got a response from the manufacturer - the actual weight is 1lb 3oz (misprint on both sites). Now what to do...I have a heavy profile 10.5 barrel that is 1.5lbs. I can't decide if the 4 or 5 ounce savings will be worthwhile or noticeable in terms of weight. I think it will be noticeable - it's a matter of leverage. I have played with a Bushmaster heavy barrel 11.5. It was not a 10.5 but the weight was not to bad. LMT has a nice gov profile 10.5 upper that is really lightweight. I dont know if you can just buy the barrel. I have only ever seen them sold as a complete upper. American Spirit, Red Barn Armory, Fat Boy Tactical, Primary Arms, etc. Barrels are out there. Thank you - never seen this site before.